More Realize They Face Pricey Long-Term Care A new poll by NPR, the Robert Wood Johnson Foundation and the Harvard School of Public Health finds that more people than ever are becoming aware of the likelihood that they will need potentially expensive long-term care health services as they age. But they still don't understand how that care gets paid for. A new poll by NPR, the Robert Wood Johnson Foundation and the Harvard School of Public Health finds that more people than ever are becoming aware of the likelihood that they will need potentially expensive long-term care health services as they age. But they still don't understand how that care gets paid for. And I'm Melissa Block. When aging Americans need long-term care, especially in a nursing home, the costs can be enormous. In this part of the program, we're going to talk about those costs and some options for seniors and their families. And we'll start with a new poll conducted by NPR, the Robert Wood Johnson Foundation, and the Harvard School of Public Health. The poll suggests that even if Americans are wising up about the costs of long-term care, knowing how to pay for it is another matter. Here's NPR's Julie Rovner. JULIE ROVNER: Earlier this week, 53-year-old Jason Mitchell of Rockville, Maryland, sat down to do something that's still fairly uncharacteristic for people his age: He talked with insurance broker Sally Leimbach about buying private, long-term care insurance. SALLY LEIMBACH: Right now, I believe you and Nina would actually qualify for the least expensive rates, which means you have the best health. And the older you get, the less likely you'll be able to qualify for those. JASON MITCHELL: You're saying that rate increase would be based upon a 53-year-old? LEIMBACH: It would be based on a 53-year-old. MITCHELL: Not where I am at that point. ROVNER: Mitchell says he and his wife are motivated to make the purchase because they've experienced the cost of long-term care firsthand. MITCHELL: A few years ago, my dad passed away at 89, and for the two years before passing away, we incurred some pretty high costs for private care. Luckily, he had the means to pay for it, but I recognize, you know, it's probably a bigger risk as all of us are living longer. ROVNER: Indeed, in our poll, more than two-thirds of people like Mitchell - over 50 but not yet retired - said they were very or somewhat likely to have trouble paying for long-term care if they or a spouse need it. And unless they're very wealthy, that's likely to be the case, says Judy Feder, a Georgetown University policy professor and long-term care expert. JUDY FEDER: The cost of care in home, which is how most people want to get it, is substantial. And the cost of a nursing home on an annual basis is now about $80,000. ROVNER: Feder says what's really helping educate people like Jason Mitchell, though, is not the work of people like her, but the one-on-one experience boomers are having with their own family members. FEDER: One of the reasons I think that people have a better understanding of the likelihood of long-term care is that boomers are experiencing it with their parents, and a lot of the responsibility for helping people who need long-term care falls on children. ROVNER: But while the public may be better at recognizing the financial threat long-term care expenses pose, there's something people still don't recognize very well. That's which government programs pay long-term care bills. FLORENCE VERDIN: You know, I'm not sure about that. ED SOLOMON: I don't know, really. SOLOMON: My wife would know better. JOAN MATTESON: I really haven't checked. I feel very fortunate because I'm very healthy. ROVNER: Florence Verdin, Ed Solomon and Joan Matteson all live at the Greenspring Village Retirement Community in Springfield, Virginia. In the poll, more than 40 percent of retirees, and nearly a third of boomers, said they thought the federal Medicare program would pay if they needed long-term nursing home care. That's usually not the case. People who don't have substantial savings or long-term care insurance mostly have to rely on Medicaid. It pays more than half the nation's nursing home bills. Yet Medicaid was only identified as a potential payer by 7 percent of retirees, and 10 percent of not-yet-retired boomers. ROBERT BLENDON: They just don't see Medicaid playing a central role. ROVNER: Robert Blendon is a professor at the Harvard School of Public Health who worked on the poll. He says that lack of recognition could soon turn into a major political problem. That's because elected officials at both the federal and state levels are even now looking for places to cut spending, and Medicaid is a big target. BLENDON: In the budget debates that are coming up, this is really important because these are, really, people at risk of needing this service over their lives. And they just think that they're going to be relying on other sources of insurance or income or savings to pay for it. ROVNER: And it's unlikely that people will fight very hard for something they don't even know they might need. Julie Rovner, NPR News. Seniors at the Greenspring Village Retirement Community in Springfield, Va., play Wii bowling. Most baby boomers say they're planning on an active and healthy retirement, according to a new poll conducted by NPR, the Robert Wood Johnson Foundation and the Harvard School of Public Health. And, in a switch from earlier years, more than two-thirds recognize the threat of long-term care expenses to their financial futures. But some experts worry that when it comes to their health, boomers are still woefully unprepared — or worse, in denial. "The mismatch between how people think the next 10 to 15 years is going to go and what current retirees experience is something that's very consistent," says Jeff Goldsmith, a health care futurist and author of The Long Baby Boom: An Optimistic Vision for a Graying Generation, a book about aging baby boomers. "There is no question that one distinguishing feature of our generation is this extraordinary, almost genetic optimism. And the poll results look to me like a lot of that optimism was drawn from a deep well of self-delusion." For example, notes Goldsmith, only 13 percent of people over age 50 but not yet retired said they expect their health to be worse in retirement than it is currently. Yet 39 percent of retirees said their health is worse than it was in the five years before they retired. Pre-retirees: At what age do you expect to retire (or partly retire, for those who never expect to completely retire)? Retirees: At what age did you partly or completely retire? If you (or your spouse/partner) were to need care in a nursing home for three months or more, how would the majority of costs be paid? Retired people are healthier in some communities than others. How important do you think each of the following things is in helping retired people stay healthy? "Hello," says Goldsmith. "That's what getting older is eventually about. We're all going to have serious health problems in retirement, and eventually really serious health problems." Similarly, only 1 percent of those not yet retired said they expect the amount of exercise they get to decrease in retirement, while 34 percent of retirees said they actually are getting less exercise. Boomers in the poll who haven't yet retired did say they are taking steps now to ensure good health when they do stop working. Seventy-two percent said they have increased their amount of physical activity or exercise; 68 percent said they have changed their diet or the food they eat, and 83 percent said they are watching their weight. That's how Aimee and Randy Rolin, of Springfield, Va., both in their 50s, are preparing for their retired years. "I've been working out for 20, 22 years now; and I plan on working out until I die," Randy says. "I hope to die healthy. ... Fast. Nice and healthy. Not laying in a bed somewhere." "And we eat right," Aimee adds. "Most of the time." Of course, good genes don't hurt. 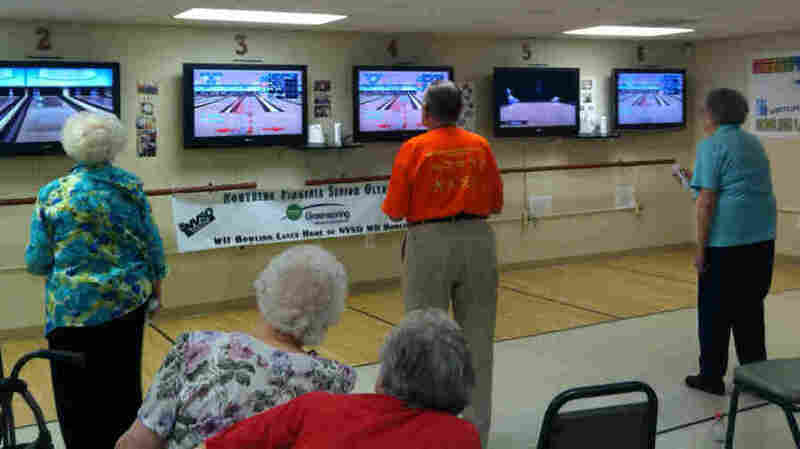 We caught up with the Rolins cheering on Randy's mother, Marcy, age 87, participating in the Wii bowling competition for the Northern Virginia Senior Olympics. Marcy, who won a bronze medal last year, this year won a silver. But Goldsmith says the Rolins are more likely the exception than the rule when it comes to the physical state of the boomer generation. "There's already evidence that people are starting into this retirement era with burdens," he says. "I mean a third of the generation is obese, and a third is overweight. And even though people talk a good game in terms of exercise, it's not clear the numbers actually support it." That, he says, could mean a lot of additional health bills. Another expensive need in older age is long-term care, including care in a nursing home, assisted-living facility, or home care. The good news is that when it comes to long-term care, the boomers are considerably more aware of the possibility of the crushing cost than previous generations have been. More than two-thirds said they were very or somewhat likely to have trouble paying for long-term care if they or a spouse needed it. That's slightly more than the three-fifths who feared they might have trouble paying overall medical bills. Judy Feder, a public policy professor at Georgetown University and an expert on long-term care, says she's not surprised that after decades of trying to educate the public on the need to prepare people for the cost of long-term care, the message is finally getting through. "One of the reasons I think people have a better understanding of the likelihood of long-term care is that boomers are experiencing it with their parents, and that a lot of responsibility for helping people who need long-term care falls on children," Feder says. "So the older we boomers get, the more likely we are to have family members who need our help." That's true of Jason Mitchell, 53, of Rockville, Md., who's in the process of purchasing private long-term care insurance for himself and his wife, Nina. "A few years ago, my dad passed away at 89, and for the two years before passing away, we incurred some pretty high costs for private care," Mitchell says. "Luckily he had the means to pay for it, but I recognize it's probably a bigger risk as all of us are living longer." One thing people don't recognize very well, however, is who pays for long-term care. In the poll, a majority of those both retired and not-yet-retired thought Medicare, private savings and private insurance would be the primary payers if they needed nursing home stays longer than 100 days. In fact, the primary payer for nursing home care across the nation is the joint federal-state Medicaid program. Yet that was identified as the most likely payer for their own long-term nursing care by only 7 percent of retirees and 10 percent of not-yet-retired boomers. That's a potentially dangerous problem, says Robert Blendon of the Harvard School of Public Health, who worked on the poll, particularly as elected officials grapple with budget shortfalls at both the federal and state levels, and Medicaid is a key target. "There's clearly going to be a very difficult moment," he says. "Because there's this very strong disconnect between, what would containing the Medicaid budget for long-term care mean to the reality of how many people are in long-term nursing home care [and] couldn't afford to be there without Medicaid paying those bills."